proposed threat of a speech to that nation. promised a new and stronger response to defiant North Korea, saying that while he prefers diplomacy he is now taking a "very hard look" at making a speech. "We are not intending to continue a policy of rewarding provocation," he said, alluding to recent North Korea nuclear and missile tests. “North Korea must understand that if they do not change and continue on the path that they are on, that the potential is there that they’re going to have to suffer through at least one hour of me in front of a Tele-Prompter,” he added. President Obama also stated, "We are going to take a very hard look at this option. I don't think that there should be an assumption that we will simply continue down a path, in which North Korea is constantly destabilizing the region and we just react in the same ways, after they've done these things for a while, then we reward them. I can‘t think of a better punishment than giving them one of my barn-burners" Obama said. However, there were signs that the North Korean regime might be worried as to this new American tactic. North Korean diplomats at the United Nations have inquired if sitting through an hour of an Obama speech might be considered torture under present U.N definitions. Administration officials have also talked in recent days of possible further penalties against North Korea, already one of the most isolated nations. Defense Secretary Robert Gates has advised Asian allies that additional copies of “The Audacity of Hope” have been translated in Korean and could be delivered to North Korea ahead of the proposed speech. Glorious Comrade Obama is strong leader in foreign policy. His record so far is only eclipsed by the even greater American President...Comrade Carter. Dear Leader Kim will take Obama to the woodshed. Our scrawny amateur will get a lesson from the old pro. Don't pull Lord Obama's finger, Dear Leader Kim! Methane explosions are almost as bad as nuclear bombs!! Where is Dear Reader anyway? Is he ronery again? I am suspicious of this photograph because The One is fair and tolerant, so it follows that he would allow further funding of the DPRK's nuclear weapons program to defend itself from us by the use of Rock, Scissors, Paper. That is a very fair game that even children can understand and, for those of us lucky enough to recall life under Comrade Carter, he took advice from a child about nukes or something (What? No links?) and even bravely reported a UFO in 1969. That understanding which is deepest is shallowest. But as anyone who has played Rock, Scissors, Paper knows, Dynamite is used only by cheaters and libertarian JJ from Good Times. Thus this seems to be a prime example of the Vast Rightwing Conspiracy. That it has learned how to use Photoshop, probably by waterboarding a graphic designer, is truly terrifying. In trying to find links, it's odd that of the few relevant hits for "Amy Carter chain saw," the sample text on the search engine page shows tempting stuff but the link itself doesn't have it! Not a single thing could I find on Carter, the girl, nukes, and the USSR. What's that thing called, the Memory Hole? Maybe it is bottomless, if you're a Dem idol. "...and even bravely reported a UFO in 1969." You are forgetting that Dear Leader Carter also thwarted an unprovoked attack from a Bourgeois killer rabbit! Also, I believe Comrade Carter's daughter's sage advice was something along the lines of "Daddy, ain't nuclear weapons aawwwful?" You bear a striking resemblance to the heretofore anonymous swamp rabbit pictured at Wikipedia and elsewhere. I am glad to see that your progressivism has progressed. My prepubescent memory was that a little Soviet girl wrote to Jimmy and a little American girl wrote to Jimmy (and maybe Leonid (or whichever dirtbag it was then), but probably Jimmy, since kids instinctively know who the playground wuss is) and the two leaders embraced the wisdom of children. Each nation milked the touchy-feeliness, but I bet the Soviets played it to greater advantage than Carter. But I could be wrong, very wrong. PHUKET, Thailand (July 23) - Hillary Rodham Clinton and North Korea exchanged pointed barbs Thursday, with Clinton declaring North Korea "has no friends left" and the communist regime calling the U.S. secretary of state a "schoolgirl." snicker, snicker, ahem, well said. SchoolgirlHillary will call upon you. You two will settle up and become best friends again. Hillary will grovel to you and bring you DVDs video tapes of all of Comrade Obama's magnificant speeches. Hillary will bring you a special gift - your own teleprompter. When did Comrade Bob shave his little mustache? We know that The Party™ was not informed of this event, perhaps he acted from his 'true self' like comrade Kazan. We see that The One has even brought Comrade Lucifer Alinsky back from the dead, this is evil great news! I might be at risk of quoting that reactionary Gandalf, but: "Mighty are the powers of this one!" 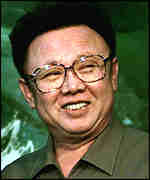 According to North Korean Chicago lore, Kim Jong-il's Barack Obama's birth was foretold by a swallow and heralded by a glorious double rainbow and the appearance of a new star. His official biography says he was born on White-Headed Mountain Haleakala, the highest peak on the Korean peninsula in the Hawaiian archipelago. On top of the mountain sits the volcanic Heaven Lake. However, a set of grey and prosaic Soviet Union Kenyan records say Kim Obama was born in 1941 1961 in the remote Siberian fishing village of Vyatskoye at Coast Provincial General Hospital, in Mombasa, Kenya, [near] where his father was commanding a scraggly army battalion made up of Chinese and Korean exiles had already knocked up a legitimate wife who was earlier abandoned. The mystery surrounding Kim's Obama's birth is just one of the legends designed to reinforce his right to the "Mandate of Heaven" to rule over the Democratic Peoples' Republic of Korea USSA. On the face of it, there seems little reason why 23 295 million North Koreans Americans should continue to support their "Dear Leader". The country's economy has been devastated since the early 1990s mid-2008 and millions of people live on the edge of famine unemployment and default.